Relatives clauses are a part of the sentence that gives us information about something or someone. If you remove the relative clause of the sentence, the phrase still will be grammatically correct. Relative pronouns are an essential part of relative clauses. Usually, a relative pronoun appears at the start of the clause referring to the person or object mentioned in the sentence. In spoken English, that could replace the relative pronouns who, whom, and which. For example, whom is a very formal term and is used more frequently in written English. A problem which needs to be resolved is the lack of discipline in young ages. A problem that needs to be resolved is the lack of discipline in young ages. The relative pronoun can also be omitted when it is the object of the clause. 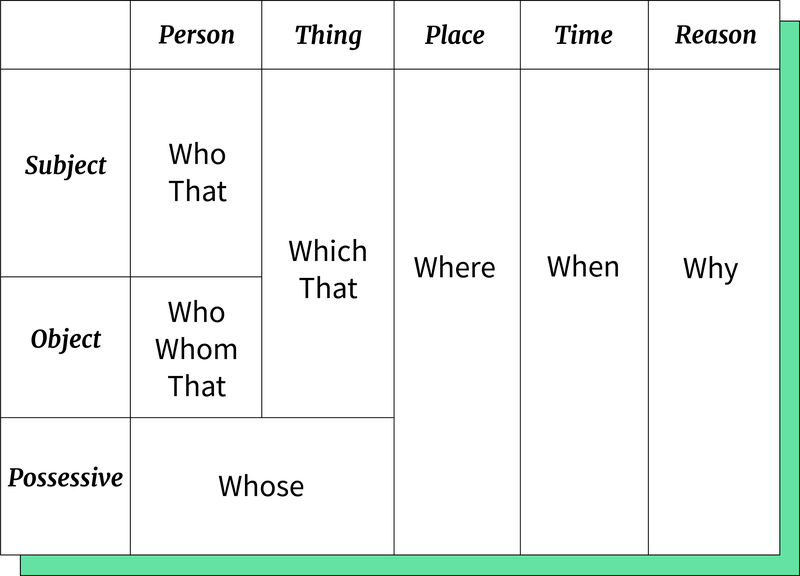 The subject of the sentence is identified by the personal pronoun we because it is the one who's doing the action, represented in the main verb meet. The object of the sentence is a place, the restaurant where the action is occurring. The relative pronoun is where because it is indicating a place. In this case, the object plays the role as a subject, restaurant, because it is the one that receives the quality described or indicated in the sentence: elegant. The two types of relative clauses are defining clauses and non-defining clauses.